Eye-catching plans are in to build a 'vertical village' on the edge of Manchester city centre featuring five landmark skyscrapers, one that would become the city's tallest building. "This 'vertical village' is a sustainable model for high-density urban living, providing accommodation, public gardens, restaurants, educational and medical amenities and potentially even facilities for growing food. The buildings are designed and orientated to allow excellent sunlight levels and attractive views from within each of the 1,390 apartments. "The focus of the vertical living concept is to create an integrated, diverse community with a range of communal areas designed at different scales and intimacies. "Situated on top of the level-three podium, the development provides access to amenities and facilities such as play spaces and community activities. Here the community can come alive, connect and enjoy the various spaces. 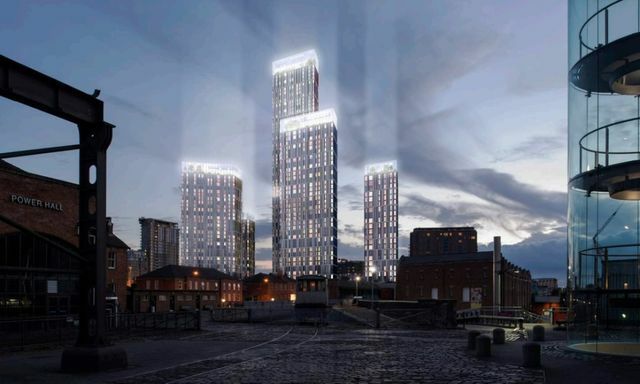 The proposed development features two 26-storey towers as well as one 37-storey, one 41-storey and one 67-storey tower. Manchester's current tallest building Beetham Tower is 47 storeys high. The residential-led development would feature 932 two-bed and 452 one-bed apartments as well as six studios, which are intended for both the private rented sector and private sale.